After a 400-million-km cruise since its launch last November, Europe’s Venus Express space probe reached its destination on 11 April, with a series of complex manoeuvres to successfully take it into orbit around Venus. For 500 days, Venus Express will study the planet considered as Earth’s twin in terms of its size and mass. But before getting down to its science mission, it first had to complete a critical 1st step, the most challenging following launch. “Venus orbit insertion (VOI) is a high-risk manoeuvre that must proceed at precisely the right place and time,” explained an engineer in charge of operations at the European Space Operations Centre (ESOC) in Darmstadt, Germany. The VOI manoeuvre reduced the probe’s initial velocity of 29,000 kph relative to Venus by 15%, allowing the spacecraft to be captured by the planet’s gravitation. This deceleration was obtained with a main-engine burn lasting about 50 minutes and consuming a significant proportion of the 570 kg of fuel on board. The preliminary VOI phase started on 4 April and will be completed when all of the probe’s functions have been restored, notably when it resumes communications with Earth after orbit insertion. By 13 April, the probe will be in an elliptical orbit ranging from 400 km at its closest point to the planet (periapsis) to 350,000 km at its furthest point (apoapsis). A further series of engine burns will then be necessary to take the probe into its final polar elliptical orbit on 7 May, ranging from 250 km to 66,000 km from Venus. Venus Express will then start its in-orbit commissioning phase, during which its instruments will be switched on one by one in readiness for the nominal science phase beginning early in June. 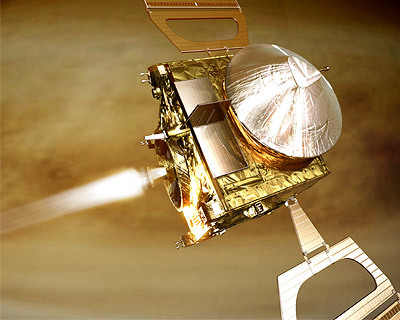 Venus Express is the 1st European space probe to reach orbit around Venus, where it will closely study the thermal structure of the planet’s atmosphere, its greenhouse effect and ionized environment. No fewer than 14 countries are contributing to the mission led by ESA. CNES and French research laboratories* helped to develop 3 of the 7 instruments on board. Virtis will measure the composition of the planet’s atmosphere and chemical interactions. Spicav will study the water cycle and atmospheric dynamics and evolution. Aspera will study the planet’s ionized environment.